The following bike building questions from novice and veteran metalworkers will improve your knowledge, and save you some time. Rick Hedrick answered some of them. We answered others. 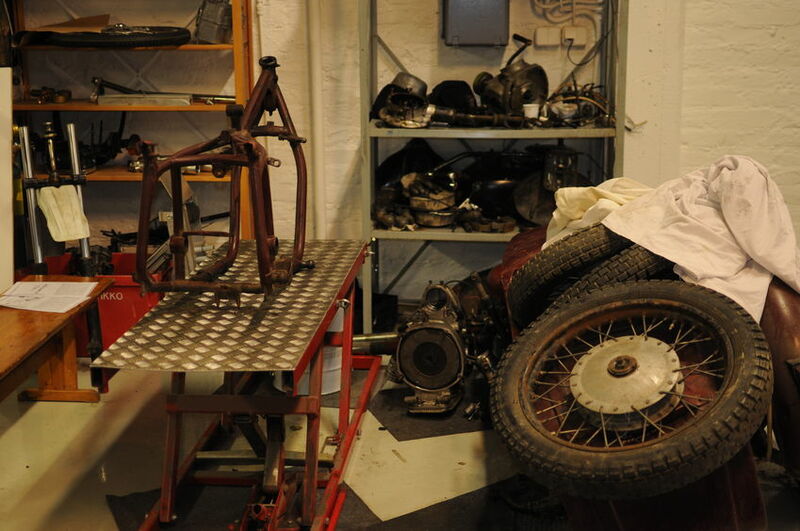 I think you will find the questions interesting and very helpful in your bike building efforts. Hi I built your pro street frame and looking for a wide glide front end for it. I've got a 21 inch front wheel and 18 inch rear wheel. Do you know what length of forks are needed so my trail is correct? Answer: Please double check measurements: Using tires with sizes described below the Fork length should be ~ 26’’ long. Calculated trail should be 3.69’’ as shown on the picture. Answer: Using a tires with sizes described below the Fork length should be ~22.5’’ long. Calculated trail will be 9.9’’ as shown on the picture. I own a 2006 Harley Deuce. It has a 160/70 b17 tire on the back and a mh90-21 on the front. I want to put a 180 on the rear but I cant find a set of matching tires to do the job. Dunlop no help, Metzeler no help, Avon no help, Harley shop no help what the f_ _ _ !!! Also can I put the 180 under it without changing the swing arm or anything else? I have attached a Metzeler brochure - take a look at page 12. Hi Gary. This mostly it depends on the state you live in. Some states registering and 'homebuilt' or 'special construction' is completed through the Highway Patrol and others it is done through the DMV/DOT. My best suggestion is to contact your local Highway Patrol and ask for special construction registering details - it is more likely than not that the folks at the DMV won't understand your question and misguide you. Some areas even have 'mobile' units and will come to you and 'signoff' on your MSO (Manufactures Statement of Origin) making it easier for you to register your finished bike. The most critical part of the registering is the MSO for the major components of your project. Frame, engine and transmission will come with MSO's or no less than a Bill of Sale if you purchase from an individual. These will be required at the DMV to register for a title. Hello again,I finally made up my mind as to who's chopper kits I'll be building. Gonna go with Big Bear Choppers since I live here close to them in Southern California, and, because their bikes come with all the legal documents I need to register and license the bikes without any trouble from the State. Anyway, here's my question...I plan to powder coat the frame and handlebars. I read in one part of your course "common mistakes chopper builders make and how to avoid them" that I need to remove the powder coat or paint from the contact points of the engine and transmission to the frame because the vibration will eventually pulverize the coating and let the parts "float." Would you advise that I do the same with the handlebars as well where they contact the upper tree? And, at the points of contact for the foot controls? Or, shall I just remove the coating from all contact points to make sure nothing can begin to float? Now that I think about it, it would probably be good to grind the powder coat off all points of contact, huh? What do you think? Hi Bobby. You are on the right track. Any finishing that ADDS material to the part - like paint, chrome and/or powdercoat - will require special attention for final fit. With powdercoat (also like paint) there are measures to 'prepare' the part before the finishing to eliminate or at lease greatly reduce the final finishing for a proper and secure fit. Placing tape or using plastic (push or screw in) plugs in threaded holes and openings that a bolt will fit through will be necessary. Flat surfaces can be taped off where you do NOT want the finish coating to be. In the case of powdercoat - the use of masking tape (green or blue) and plastic plugs is important. The tape and plugs will not conduct the necessary energy for the powder to 'stick'. But it is also very important to CAREFULLY remove the tape and plugs, without disturbing the powder, before the heating of the finish. After the part has been heated and cooled it can now be safely handled to inspect all of the flat surfaces and bolt holes for material that might have snuck through. This material can usually be easily removed with a razor blade - 'grinding' may not be necessary and could easily damage the part. As for what parts require this process - well all that you finish should get the same attention. If it is coated and gets bolted down the part and the contact surface will - over time - eventually wear and loosen like the example you used of the engine. 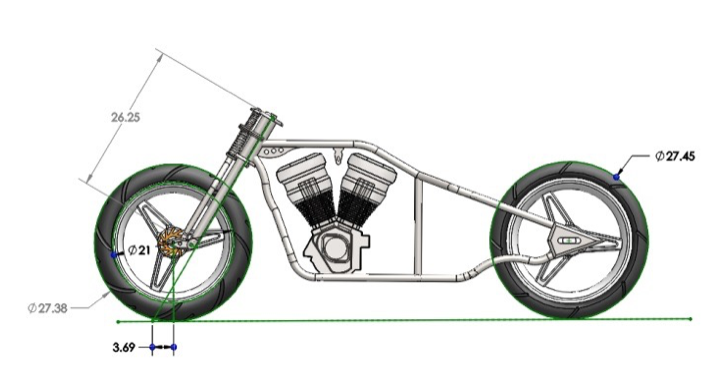 Do you know what the angle of turning the Triple Tree in the Neck of a Big Twin? This varies from model to model and year to year on stock bikes. As for custom and aftermarket forks the internal steering stops are set to either 30 or 45 degrees. For the internal stop design you just flip the stop around to adjust 30 to 45. Rake angle - including what is added into the trees - the handle bars and tank location all make a difference in what angle the stop is set. Hi Darren. This is a popular question... This is also a very important and critical issue. CM 4130 (DOM) is an ideal material for frame building - but a bit overkill for a first time or street bike. The 'black pipe' (sched 40) is OUT - NO WAY - this is PIPE not TUBING. There is a difference. First of all tubing is measured on the OD and pipe is measured on the ID. Tubing is much easier to bend and weld where pipe (with the proper wall thickness) is almost impossible to bend - will crack or split - and is difficult to weld. The most common material is DOM (seamless) mild steel. This material is easy to cut, bend and weld while offering a strong and (somewhat) light weight frame. As for the bender there too is a difference - pipe and tubing - you want a tubing bender. Stay away for inexpensive pipe benders - the dies are wrong and the benders are usually not heavy duty enough. For a good TUBING bender try JD Squared (www.jd2.com). I live in WA state and I was curious about getting a title for a home built frame. I was looking at purchasing blueprints to build a frame jig and blueprints to build a frame, then i went to the Miller welding website and the guys are talking about pulling serial numbers from old frames with titles. Could you give me a heads up on titles and serial numbers? Will it be a hassle to license and register my bike with the DMV, DOL if I don't have serial # on my frame? And can I put my own serial # on my frame and register it with the state? Thanks for your time. Tyson...Yes it is possible to 'pull' a vin from a trashed frame (with title) but if you want to start from scratch you will need to contact your local highway patrol and ask them the procedure for a 'special construction' or 'homebuilt' title. You will ultimately end up at the DMV but if you start there they will 'have no idea' how to help. As for registering the completed bike you will need the paperwork from the HP, the MSOs for the engine and trans as well as other misc big ticket item receipts. All they are really looking for is stolen parts... If you can prove ownership with MSOs and receipts you will have no problem. Hi. I am interested in building a rigid chopper frame as was hoping for a list of materials so that I could do a costing. Do you have a typical bill of materials for your frame designs including what type of steel should be used? Hi Mark. This is a very broad area. Material requirements will be different for each size (tire) frame. From 140 to 330 will be very different. Most common material is mild steel 1.25" - BUT larger - 1.375" - 1.5 " material - can be used. There is a detailed Material Schedule included with each print specific to that size frame. What kind of motor can I put in the Old School Bike? What is the angle of the bike? The Ol'Skool frame is designed for a HD twin engine - Evo style including Pan, Knuckle and Shovel - NOT TWIN CAM. The neck is set at 35 degrees but can be changed/modified in the jig. Thank you! Dear Sir. Before starting a "homemade" frame project. I am wondering how to go about getting the frame licensed. Clay. This mostly depends on the state you live in. Some states registering a 'homebuilt' or 'special construction' is completed through the Highway Patrol and in others it is done through the DMV/DOT. My best suggestion is to contact your local Highway Patrol and ask for special construction registering details - it is more likely than not that the folks at the DMV won't understand your question and misguide you. Some areas even have 'mobile' units and will come to you and 'signoff' on your MSO making it easier for you to register your finished bike. Have all of your receipts and proof of ownership to parts like the engine and transmission ready. Chopper registration and registering is not that big of a deal - the state is ultimately looking for stolen vehicles/parts! Is there any notes or information involving a single down tube, curved backbone, or a drop seat in any of your softail building prints? Brian...Sorry - the prints do not offer any info on downtube, backbone or seat modifications. These modifications are very personal in design and is left up to the creativity of the individual builder. A welding jig is strongly recommended (actually necessary) when making any or all of these changes. The single downtube modification is rather simple and straight forward - join the two downtubes by bending inward (towards the center of the frame) - any angle - to join up with a single - straight or curved - downtube attached at the neck like the backbone. As for a modified backbone and seat location - engine and transmission locations will be critical in the placement. Obviously any seat modification will require the relocation of the oil bag. "My wife ordered from your company for me. I received your video and felt so confident in the knowledge gained that I ordered the soft tail plans the very next night. Not only did it bolster my confidence but also my level of excitement. I'm just waiting on my next shipment to get started. I feel like a kid waiting for Christmas to hurry up and get here. Thank you and I hope to continue doing business with you in the future. Please hurry with my plans so I can get started." What Are Your Thoughts On This Bike Building Questions and Answers Article? Can You Build A Sport Bike or Drag Chassis On Your Jig? 3 Inch Radius Bend On 1.5 Inch Tubing? Legal Title For A Harley Frame Swap? Rake & Frame Stretch Question? Conversion From FLHS into Road King Article? Which Die Should I Use? I have a JD2 bender. Which die would be used for building a frame using 1.5 DOM? 4.5, 5.5 or 6.5 radius? How long should springer forks be on a frame with a 34 degree rake, two inch stretch in back bone and twenty one inch front tire? What I want now is can you convert the old panhead engine to run better by putting new parts on it? Well where do I find frames? it's a new thing for me. How do I restore my CB 400 II? I am trying to center the rear fender over the tire but the tire is offset because of the sprocket. Any thoughts on how to center my rear fender?